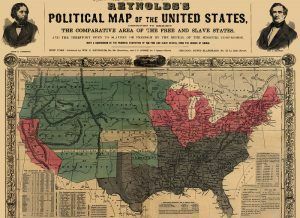 1856 map showing slave states in gray, free states in pink, U.S. territories in green, and Kansas in white. 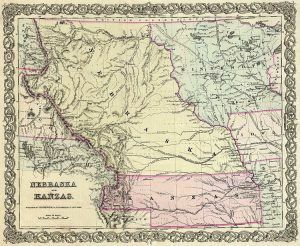 The Kansas-Nebraska Act of 1854 not only created the territories of Kansas and Nebraska but also repealed the Missouri Compromise of 1820 and allowed the territory settlers to determine if they would allow slavery within their boundaries. Though the initial purpose of the Kansas-Nebraska Act was to create opportunities for a transcontinental railroad, the act would instead, spawn the Civil War and it would be years before a transcontinental railroad would be completed. For more than 30 years prior to the organization of Kansas and Nebraska as territories, the slavery question had been a “bone of contention” in the halls of Congress. The first petition of Missouri for admission into the Union in March 1818, started the agitation that culminated in the passage of the Missouri Compromise on March 6, 1820. Of the original 13 states, seven were free and six were slave states. 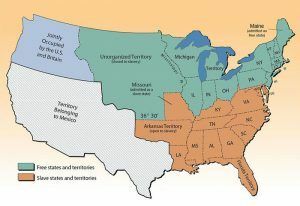 From the adoption of the Constitution to 1819 five slave states — Kentucky, Tennessee, Louisiana, Mississippi, and Alabama — had been admitted into the Union, while during the same period, four free states — Vermont, Ohio, Indiana and Illinois — had been added, so that in 1819, immediately after the admission of Alabama, there were 11 of each. The admission of Maine in 1820 gave the free states a majority of one, but the equilibrium was again restored by the admission of Missouri in 1821. With the exception of short intervals, this policy of equality was maintained during the next 20 years. Arkansas, a slave state, was admitted in 1836 but was followed by the free state of Michigan in 1837. The admission of Texas and Florida in 1845 gave the slave power a slight advantage, which was regained by the free-states with the admission of Iowa in 1846 and Wisconsin in 1848. 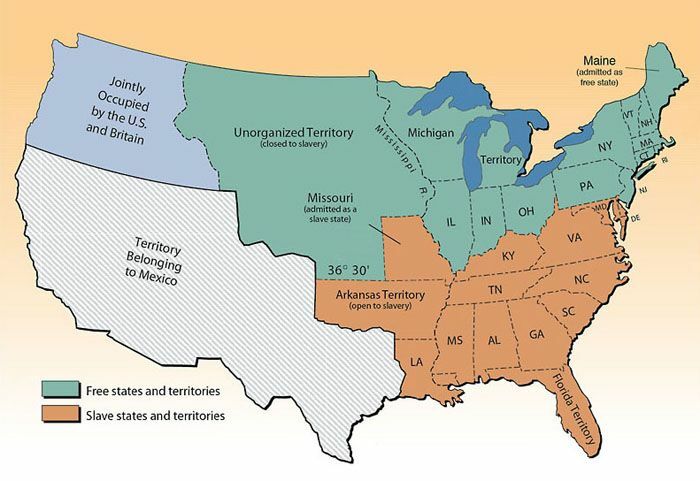 By that time, practically all the available territory south of the line of the Missouri Compromise had been divided into states and the slaveholders were compelled to look for a new field if the institution was to be extended. 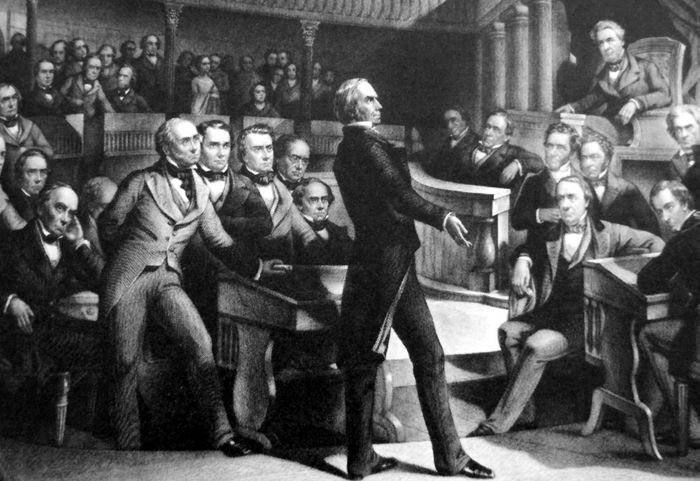 After a heated debate that lasted eight weeks in the first session of the 31st Congress, over the admission of California, Henry Clay, on January 29, 1850, introduced the resolution which formed the basis of the celebrated “Omnibus Bill,” or compromise measures of 1850. These resolutions, and the bill which followed provided for the admission of California “without the imposition by Congress of any restrictions in respect to the exclusion or introduction of slavery within those boundaries.” With the admission of California as a free state, which made 16 free to 15 slave states, the slave power was driven to desperation. Soon the region west of the Missouri River began to organize into territories, and, as all this section lay north of a line of the Missouri Compromise, the cry went up for its repeal. 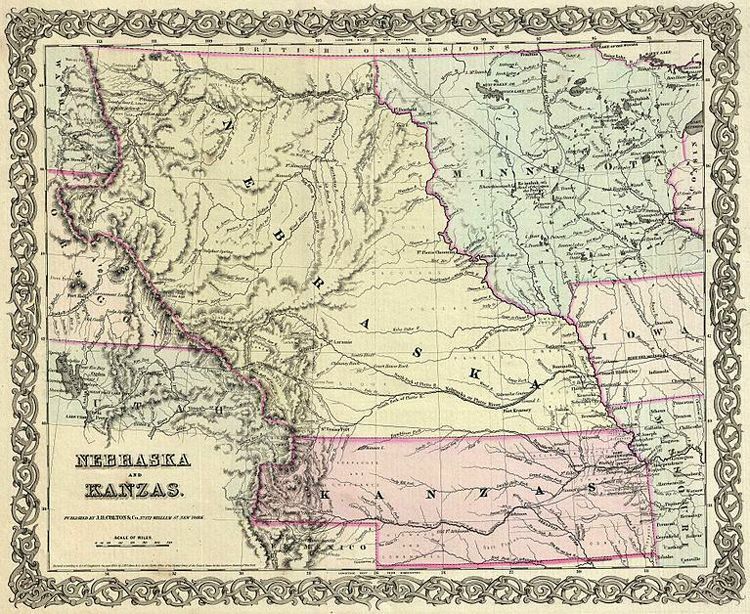 Petitions were received in the first session of the 32nd Congress, in 1851-52, for the erection of a territory west of the Missouri River, but no action was taken. The first real effort in Congress to organize a territory including the states of Kansas Nebraska was made on December 13, 1852, when Willard P. Hall, a member from Missouri, introduced a bill providing for the organization of the “Territory of Platte,” to include both the present states of Kansas and Nebraska. However, nothing came of this bill and over the next year, more bills were submitted, argued, and rejected. 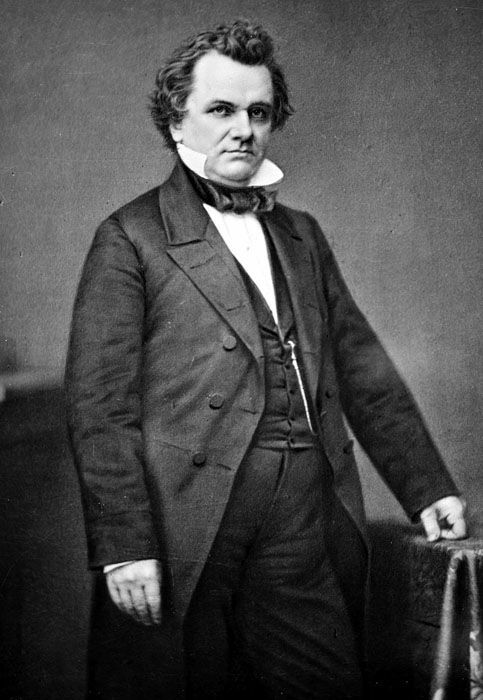 On January 23, 1854, Senator Stephen Douglas of Illinois submitted a substitute bill, providing for two territories instead of one — the northern territory to be called “Nebraska” and the southern one “Kansas.” Douglas hoped to gain southerners’ support under the presumption that the more northern territory would oppose slavery while the more southern one would permit it. This was the origin of the term “Kansas-Nebraska Bill,” which, in a short time, became a familiar expression all over the country. A long and bitter discussion followed, but, the act passed Congress and was signed by President Pierce on May 30, 1854, opening up the territories of Kansas and Nebraska. 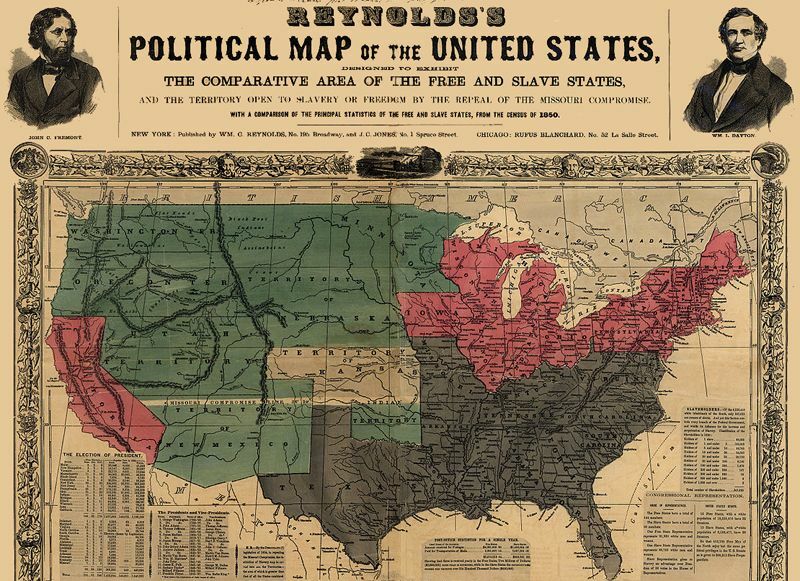 The Kansas-Nebraska Act infuriated many people in the North who considered the Missouri Compromise to be a long-standing binding agreement but was strongly supported In the pro-slavery South, who saw it as an opportunity to make Kansas a slave state. Southerners and pro-slavery men, especially from Missouri soon flooded Kansas with the goal of voting in slavery. Alternatively, abolitionists and Emigrant Aid Societies came from the north to ensure the state would reject slavery. For the next seven years, an internal civil war would be fought in Kansas over the issue, resulting in the territory earning the nickname of “Bleeding Kansas” as the death toll rose. Eventually, the anti-slavery settlers outnumbered pro-slavery settlers and on January 29, 1861, just before the start of the Civil War, Kansas was admitted to the Union as a free state. Compiled and edited by Kathy Weiser/Legends of Kansas, updated November 2018. Blackmar, Frank W.; Kansas: A Cyclopedia of State History, Standard Publishing Company, Chicago, IL 1912.